Are you working a seasonal job this holiday season? 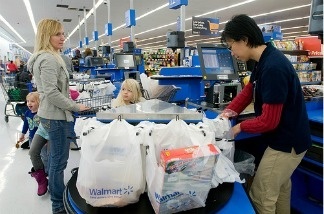 A Walmart cashier standing at her job. The holiday – and shopping – season is upon us. KPCC news producers are looking to speak with somebody who is working a seasonal job this holiday season. Please take a couple of minutes to share your insights, and a producer may reach out to you directly. We read every response, but nothing is shared without your permission.